Go to any track on club night or before a meeting and watch the athletes for ten minutes or so before they begin their session or race. The chances are you'll see lots of them performing strides. You might also see strides referrred to as "striders" or "stride outs", and although definitions can vary, it's probably easiest to just think of them as "short, relaxed sprints executed with good form". Strides come with a multitude of benefits and are a type of running that can safely be included year round, regardless of a runner's phase of training or their distance or race focus. Learning to run efficiently at fast speeds can contribute to better efficiency and economy (how much oxygen is used at a given pace) when running at all slower speeds. Strides are a great opportunity to practise good form. As with efficiency, good form at faster speeds will often translate into good form at slower speeds. Even if you're not interested in racing shorter distances, it's nice to have a good finishing kick. Running fast requires a great deal of coordination, some of it conscious, but much of it taking place at a lower level. Practising coordination improves coordination. Running fast requires strength and power and doing it will also help develop these components of fitness. You will improve your range of motion with fast running. Improving your range of motion, both in general and before a session or race, can help you to work more efficiently and to coordinate yourself more appropriately. It'll also mean you're less likely to reach the limits of your range, meaning you can run more comfortably and avoid injury. Strides are a great way of breaking up longer runs and adding a bit of variety. Strides can help you "tune in" to race pace. And running at race pace or faster than race pace in the warm up before a race can make the early stages feel a bit easier. Running fast stimulates fast-twitch muscle fibres (there are two broad classes of muscle fibres: fast- and slow-twitch: slow-twitch fibres are engaged when you're running at relatively slower speeds and the fast-twitch variety are used for speedier stuff). Training fast-twitch fibres is of obvious benefit to shorter distance runners and those looking to improve their finishing kick, but even if you have no interest in racing anything shorter than a marathon they could help you out. There is some evidence to suggest that well-trained fast-twitch fibres can help out when slow-twitch fibres start to fatigue (for example in the later stages of a marathon). Running fast feels good. Really stretching your legs out provides a sense of exhilaration and freeness. There is no strict definition on how fast a stride should be. The speed is likely to fall somewhere between about 400m and 1500m pace. Or about the pace you could maintain for 45 seconds to 6 minutes in a race situation. The key is to balance the effort. You want to be running fast enough so that you're getting a good turnover, but not so fast that you cannot relax and running form is impaired. Each stride should be short enough so that you don't begin to suffer the effects of a prolonged hard effort, which will affect your ability to run with good technique. If you are struggling to maintain form, breathing heavily or just suffering in general, then you are definitely running too far or for too long. When planning any type of running session, be it short repetitions, or a longer steady run, it's best to consider time spent running rather than distance covered. Note that it's the duration of an effort that dictates intensity, not the distance. Obviously the two are related, but the problem with specifying components of a running session in terms of distances is that runners of different abilities expending the same effort over the same distance will take different times to complete that distance. Because of this they will be stressing their body to different degrees. Having said this there is nothing wrong with repeating strides over a fixed distance, as long as the time it takes to cover that distance is in line with your ability. And using a measured distance actually has the benefit that it's much easier to run to a specific point than to monitor elapsed time while running fast. The best approach is to first time yourself running for a given duration and note how much distance is covered. Another good option when it's not convenient to use distances or monitor time is to work out how many steps you take in a given time and then count out a certain number of steps when performing strides. How long you should spend performing a stride will depend on the intensity at which you are performing it. The table below gives rough guidelines. You may find it useful, particularly for the faster paces, to begin with a rolling start or an acceleration zone. The time spent accelerating can also provide a useful opportunity to focus on the stride ahead and to adopt any techniques you wish to employ executing it. The key with recovery is to take enough after each stride to ensure that you are fully prepared, both mentally and physically, to perform the following one to the best of your ability. 2-3 minutes is usually sufficient. After this time, a significant portion of energy stores will have been replenished. Feel free to recover while jogging if you're doing the strides as part of a longer run. Just be sure that you've recovered well enough to attack each stride with full concentration and good form. If you're warming up before a race – and to a lesser extent before a training session – then bear in mind some advice that you should also be following for the rest of your warm up: do as little as possible to achieve the intended goal. You don't want to do such a large warm up that you end up too exhausted to race well. 3-5 short strides is probably a good number, although if a race is running late it's a good idea to include a few extra to keep warm and limber. As part of an easy/steady run 6-8 is about right. Much more than this and you risk over-exerting yourself (which is not the goal of easy or steady runs). You can also make strides the main focus of your session (see below). In this case a good target is 12-30. 1. As part of an easy/steady run. One option is to perform the strides a mile or two into your run, jogging for recovery between each. Another option is to perform the strides at specific time or distance intervals. E.g. one stride every 5 minutes, or one stride every mile. This is a great way to break up runs. Including a few strides at the end of a warm up can be a good means of ensuring that the full range of motion required for the session/race has been achieved. This will also help you to "tune in" to training or race pace. A session composed purely of strides (ignoring warm up and cool down) can be extremely useful in a number of cases, such as when introducing speed into your schedule or when you want to work on technique. When strides are the sole focus of your session, and you're performing more than in other situations, then it's important to be sure to take enough recovery. It will take slightly longer after each subsequent stride to recover fully and you will get more and more fatigued as the session goes on. Remember you want to be fresh and focussed before performing each stride. A good approach is to break the session up into sets, with longer recovery between sets than between reps. For example, you could perform 4 sets of 5 strides, with a walk back recovery after each rep and an extra 2-3 minutes recovery between sets. It's not uncommon to see athletes performing strides at the end of a session. The idea generally being to improve ability to run fast when tired. If you're clear that this is your goal then proceed, but with caution. Be aware that practice doesn't always make perfect, but it does make permanent. If your form is suffering because you're tired when doing strides, then this can easily filter through to the rest of your running. Establishing good form when well-rested will have a positive effect on your form when tired, so it's best to focus on strides when you're bursting with energy. The most important thing to consider when choosing where to perform strides is safety. When you're running fast you have less time to react to obstacles and you're more likely to be affected by the terrain and weather conditions. Since you are likely to be concentrating hard on your technique you may also be less aware of the surrounding environment. Ideally you'll be able to perform your strides on a flat terrain with good traction and no camber. If conditions are wet or you're unsure how well you'll cope with running fast then gradually build the speed of each subsequent stride. Running tracks, being designed for running, are unsurprisingly ideal for strides. The surface is guaranteed to be flat and consistent. You may want to wear spikes in wet weather. Pick an area free from traffic (definitely vehicular and ideally also human) and without a camber. Tarmac is preferable to paving slabs, which can often be uneven. You are far more likely to get injured when running fast and things that can be a minor inconvenience at slower speeds become hazardous when moving quickly. Freshly-mown, lump-free grass is great if you can find it. Do take care since even short grass can sometimes hide hazards, so it's worth jogging over the area a few times to save yourself from any nasty surprises. Running uphill is great for building strength and power and can force good running form (for example, it's much harder to run fast uphill if you don't get up on the balls of your feet or if you don't drive your arms or run tall). Running fast on a gentle downhill is an excellent way to improve speed. Fast movement patterns are learnable at a neuromuscular level, which means that you can teach yourself to run faster simply by running fast. By letting gravity lend a hand you can force yourself to run a little faster than you would ordinarily and the brain-muscle pathways associated with movement and coordination at speed will be engaged and improve as a result. When performing strides you should ensure good form at all times. A good posture can correct a manner of technical problems. It'll open up your chest making breathing easier, it'll help you to relax your shoulders and neck, improving atm action, and it'll open up your hips so that less stress is put on the hip flexors facilitating leg swing and improving cadence. It's natural to tighten up when running fast and this isn't useful for executing the complex series of biomechanical movements that running requires. Try to relax specific areas, focussing on just one at a time. Parts of the body that are prone to tightening up when running fast are the shoulders and neck, the jaw and the hands. There can often be a cascading effect with tightness: once one body part becomes tense, others follow. If you really struggle with relaxing then a few dynamic stretches (e.g. 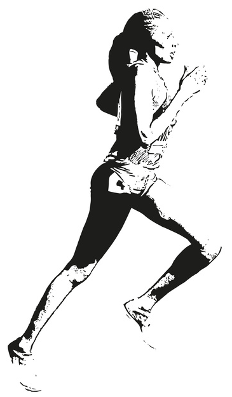 arm swings) between strides might help. Driving your elbows backwards when running fast will help stabilise the trunk and engage opposing hip flexors, facilitating knee drive. Try and keep arms bent at about a 90 degree angle, increasing the angle slightly as the arms drive back. Execute a "sockets to pockets" action (at their uppermost point hands should be in line with shoulder sockets and when pulled back should be in line with the hips) and focus on the backwards - rather than forwards - motion of the arms. Different foot strikes seem to suit different runners, but when running fast almost everybody will benefit from a mid- to fore-foot strike. Focus on the ball of the foot hitting the ground first. Dorsi-flexing the foot, i.e. pulling the toe up towards the shin, helps pre-stretch the achilles tendon and calf muscles. It's been shown that pre-stretching increases the return of energy following foot strike. Getting this right will mean you can run faster for the same effort. Fully extending the leg just before toe-off can help ensure you apply maximum force and propel yourself forwards better. Extend the hip, knee and ankle and deliberately push down and backwards. Experiment with different rhythms. It's very fashionable to advocate a cadence of 180 steps per minute, and while it's true that it's common for beginners to have a lower cadence and to overstride as a consequence, trying to prescribe a precise, perfect value for cadence ignores a variety of factors such as ability, height and body-shape, each of which will affect an individual runner's optimal stride rate. Instead of rigidly trying to adhere to a predetermined value, experiment by picking up your stride rate a little during some strides and dropping it slightly during others. You'll soon discover what works for you. Do note that with a higher cadence, as well as reducing overstriding and the braking effect that comes with it, you'll be spending less time in the air between each step and therefore landing with less force and experiencing less overall stress to the legs as a result. We have an entire article on using mental imagery to improve your running. Strides are the perfect opportunity to practise the techniques described in the article. Login or register now to access it. Give strides a go and you'll add variety to your sessions, improve your speed, strength, power, coordination, form, technique, preparation, focus, efficiency, economy, range of motion, warm ups, enjoyment and be a better and happier runner.